4.1 out of 5 based on 48 bloggers and 7 commenters. 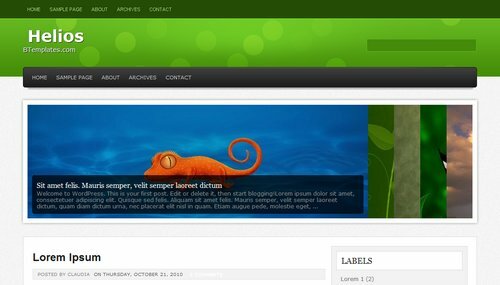 Helios is a free premium blogger template adapted from WordPress with 2 columns, right sidebar, slider, abstract and geometric motifs. how do i change the images? @Yebsite: Please, read the “Instruction.txt” file which is included in the package that you downloaded. @McIman: You must find that code in Design/Edit HTML, replace the images and put your own URLs and descriptions for each image (or featured post). how to using this slider on other theme!? e.g. themes that created by Blogger! Hope to hear from you soon….!!! Hi all, I downloaded this template (Helios) and I’ve adapted to my tastes but I have a little problem. Currently I have two blog. In the first I have the blog archives alongside popular as mestra in the image. In the second blog I have separate blog archives and popular are two different widgets. I am currently in the second blog (Template Helios) occurring together “blog archives and popular, as shown in the picture.